Synopsis: Knowing is less about information and more about transformation; less about comprehension and more about being apprehended. This radical book develops the notion of covenant epistemology--an innovative, biblically compatible, holistic, embodied, life-shaping epistemological vision in which all knowing takes the shape of interpersonal, covenantal relationship. Rather than knowing in order to love, we love in order to know. Meek argues that all knowing is best understood as transformative encounter. Creatively blending insights from a diverse range of conversation partners--including Michael Polanyi, Michael D. Williams, Lesslie Newbigin, Parker Palmer, John Macmurray, Martin Buber, and James Loder--Meek offers critically needed "epistemological therapy" in response to the pervasive and damaging presumptions that those in Western culture continue to bring to efforts to know. The book's innovative approach--an unfolding journey of discovery-through-dialogue--itself subverts standard epistemological presumptions of timeless linearity. 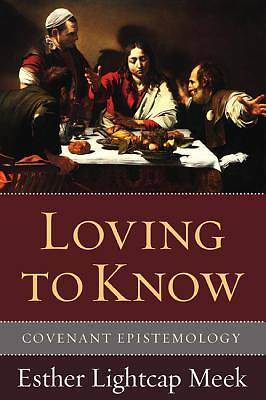 While it offers a sustained and sophisticated philosophical argument, Loving to Know's texts and textures interweave loosely to effect therapeutic epistemic transformation in the reader. Endorsements: "Nobody acquainted with philosophical epistemology would associate it with eloquence or passion. So Loving to Know is extraordinary, because this is epistemology presented with both eloquence and passion, addressed to the person 'on the street' but at the same time raising issues that professional philosophers should take account of. In a most creative way, Professor Meeks takes Michael Polanyi's epistemology, which she perceptively and lucidly summarizes, into new terrain. She argues that to come to know as we ought to come to know is to keep covenant. It is to be faithful both to the known and to oneself, the knower. So take and read. And when you do, you will learn that how the book came about is itself an example of the theory, as is the innovative structure of the discussion. The formation and presentation of the theory display the theory." --Nicholas Wolterstorff Noah Porter Professor Emeritus of Philosophical Theology Yale University "Esther Meek has given a good gift in Loving to Know, continuing her lifelong reflections on a more human and truthful understanding of knowledge. Drawing on the best of scholarship, she is her own scholar too, offering a unique vision of a covenant epistemology, a way of knowing that is deeply personal and responsible, because it is profoundly relational. A book for every one of us, as we take up the most perennial of human questions, viz. what will we do with what we know?" --Steven Garber Director The Washington Institute "This book is a tour de force of clarity, depth, and compelling wisdom. Esther Meek argues that we become what we love and that if we love truth then we must love to engage in the interpersonal dialogue of seeing the world well through the prism of another's heart. Her premise is lived out through dialogue with a range of authors that makes my head spin. She seizes their wisdom and yet pursues it further to the person of Christ than any I have read. This is an epistemologically therapeutic embrace of how to live well in the world of divergent thought that nevertheless longs to reveal Jesus as the center of all true wisdom. It is a breathtaking and beautiful labor." --Dan B. Allender Professor of Counseling Psychology and Founding President Mars Hill Graduate School Author Biography: Esther Lightcap Meek is Associate Professor of Philosophy at Geneva College in Western PA. She is also the author of Longing to Know: The Philosophy of Knowledge for Ordinary People (2003).